After a quick journey along Israel’s flawless roads, a crowded, gear-grating mini-bus deposited its passengers in front of an enormous shed. From the outside, it resembled an airport hanger – from the inside, a gigantic sheep pen. After shuffling my way along a concrete path encased by wire fencing, I entered Bethlehem’s “processing” area. 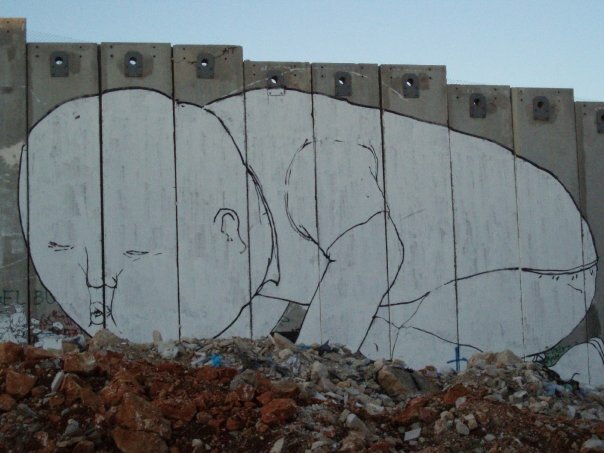 It was flanked by the separation wall, which stretched as far as the eye (sore) could see. The queues inside the shed were plentiful and long, but after being identified as a foreigner, I was ushered to a different counter. No one else was waiting. I flashed my passport, passed through a metal detector and emerged out the other end in a matter of minutes. But as I peered over my shoulder as I walked away, I watched old Palestinian men bending over to remove their shoes, belts and winter jackets. Others, including children, were being subjected to identification tests and finger-printing. Palestinians must have permits to leave and enter the West Bank, and may be rejected from doing so without any means of recourse. It was so demeaning and so, so sad. Equally sad is the fact that ordinary Israelis cannot witness the humiliations suffered – because they are forbidden to enter altogether. 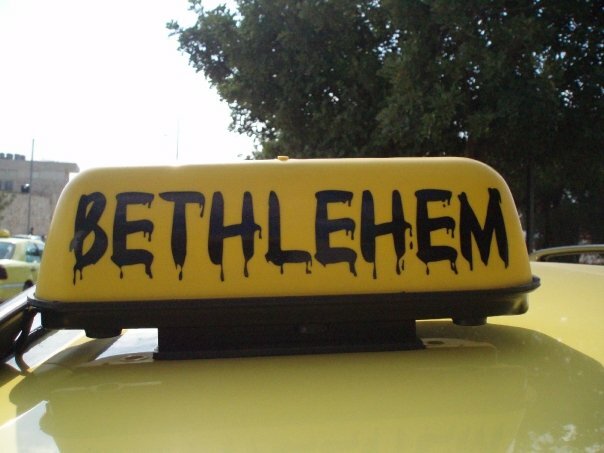 Vampire font for Bethlehem’s taxis! And yet I couldn’t suppress a ripple of excitement — here I was, in the fabled land of Bethlehem, where all my childhood Christmas stories had begun. This feeling quickly dulled as I scanned my surroundings, which were dominated by the wall’s grey concrete slabs. At eight metres, it’s twice as high as the long defunct Berlin Wall. I caught a taxi to the centre of the old town and had my picture taken standing beside baby Jesus’s (allegedly authentic) manger. I met briefly with a member of the activist group “Open Bethlehem” and the head of the city’s tourist police. I learnt that tourism has dropped by around 70 percent over the last five years (as at 2008). Furthermore, fewer than 30 per cent of visitors choose to spend the night in Bethlehem, despite the fact that there are more than 30 hotels. The vast majority – around 75 percent remain in the city for less than two hours. 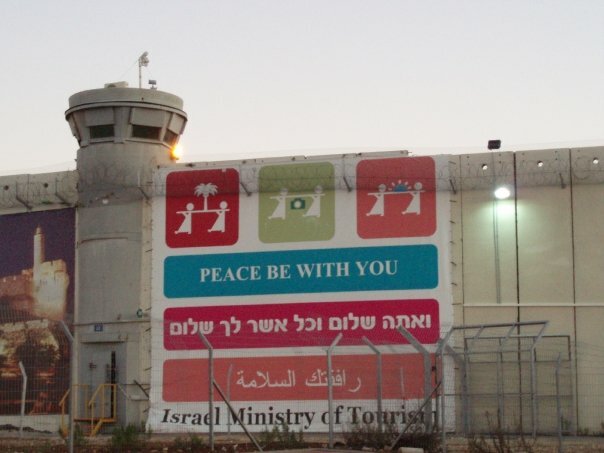 Apparently, the Israeli government sends out regular messages that the area is unsafe at night. As I walked away from the bustling square, I felt as though I’d stepped into a different country. The roads were poorly constructed and congested, the houses dilapidated, the cars run down and shops sold limited wares. Scores of men stood idly on street corners smoking cigarettes, while a few young boys manned fruit stalls. 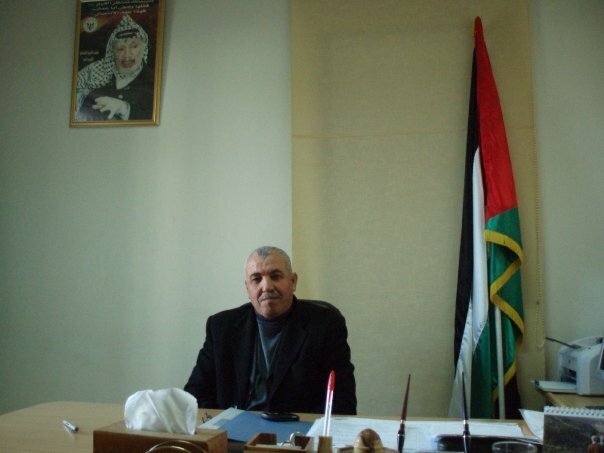 Ramallah, the administrative capital of the Palestinian National Authority, looks much the same, or perhaps worse. I dropped into Aida Refugee Camp and met American volunteer teachers and their over-excited pupils. The separation wall was within spitting distance from the camp, and a local pointed out a girl’s school across the road whose windows had been filled in due to shelling. 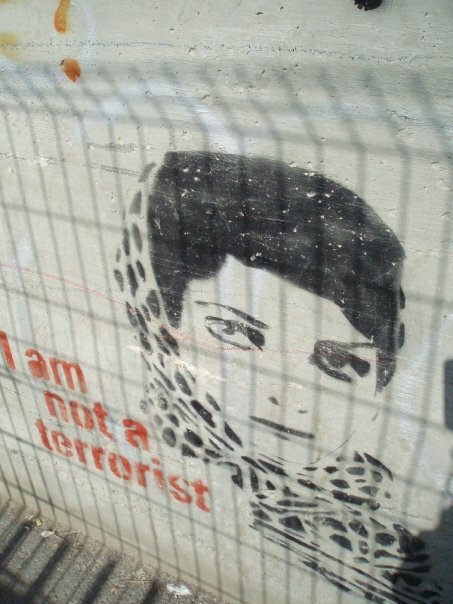 Although the separation wall horrified me, the protest artwork that adorns it was inspiring. Whilst it’s completely blank on the Israeli side, the Palestinian side is heavily decorated with messages of peace, humanity, anger and despair. Pink Floyd’s Roger Waters, who famously penned “The Wall,” has visited and left his mark; so too has Britain’s famous graffiti artist Banksy, whose identity remains unknown. For a stretch of around 500 metres, you don’t see a wall, but a gigantic petition against segregation. When it comes down – whenever that may be – I hope the images are preserved to remind us of this low point in humanity. When I left the West Bank around sunset, a long line of cars had piled up at the gate, some stocked with fruit and other goods. I suspected night would fall before they were given the chance to pass through. For those who rely on passage to earn an income selling goods in Jerusalem, I could only wonder how they manage to cope with such daily frustrations. The rest of my trip was relatively uneventful – that is, until I reached the airport. Customs opened my bag and discovered the leaflets and DVDs I’d collected from various organisations in the West Bank. My Australian passport was also subjected to inspection, and when the official caught sight of my visa for Pakistan, things got pretty hostile. Did I know anyone in Pakistan? Was I still in contact with anyone? What were their names and addresses? I stood dumbfounded before six customs officials, one of whom tipped open my bag and scoured its contents with a bomb detector. Other passengers, including dozens of Orthodox Jews, stared at me suspiciously. My eyes narrowed in return – after two hours of questioning and public humiliation, I was in no mood to assure them that I wouldn’t blow up their plane. Were I capable, however, of blowing up the separation wall, I may very well have been tempted.